Under normal conditions, cells in the human body must divide to replace damaged or destroyed cells. Usually various chemical signals indicate when cells should stop dividing and replicating. Sometimes, these signals are blocked or not created and cells continue to divide, resulting in a potentially cancerous growth. Cancer, of any type, is a terrible disease that directly or indirectly affects nearly everyone in the U.S. The American Cancer Society estimates that 1 in 2 of men and 1 of 3 women in the U.S. will develop cancer during their lifetime. Although improving technology has helped to improve survival rates, cancer still remains one of the most deadliest diseases. 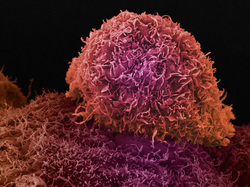 In this unit we will examine what cancer is, why it occurs, how it might be stopped, and types of treatment. What causes cancer and why doesn't everyone have the disease?